Putnam and Westchester County residents with disabilities were given the opportunity to work in a field that interests them as CAREERS for People with Disabilities coordinated the fourth annual Disability Mentoring Day on October 21st . A collaboration with Putnam County Executive Mary Ellen Odell, Westchester County Executive Rob Astorino and County Departments, the event paired mentors from both Counties and individuals with disabilities who were interested in learning about the skills needed to be successfully employed. 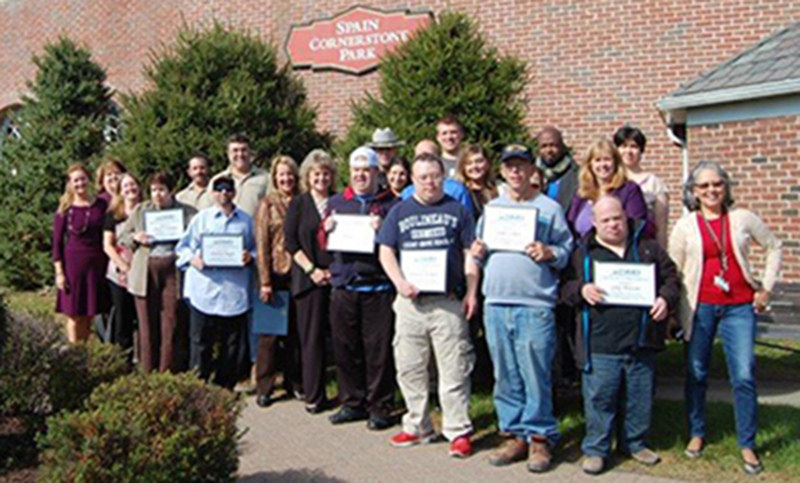 CAREERS and PARC clients in Putnam County and WARC, WJCS and CAREERS clients in Westchester County were matched with department staff, based on the interests of each mentee. In Westchester, county departments participating included Emergency Services, Public Safety, Human Resources, Community Mental Health, Environmental Facilities, Finance, Parks and Recreation, Tourism, the Human Rights Commission and the County Attorney’s Office. In Putnam, the Consumer Affairs, IT, Finance, Highway and Purchasing departments, as well as Office for Senior Resources, County Sheriff and Youth Bureau all hosted individuals for an interesting and informative morning. 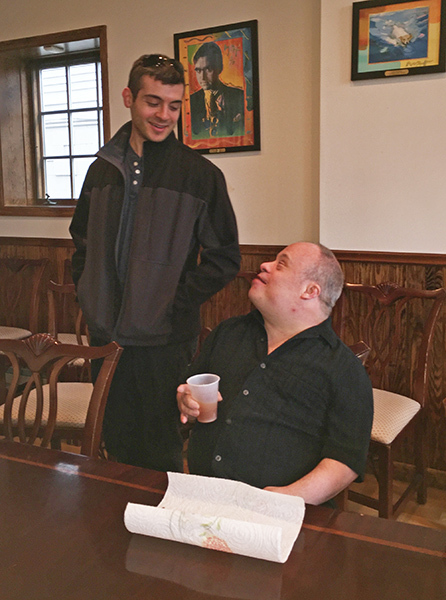 Chris Kaatz, CAREERS Employment Specialist, pictured below left, started the morning by prepping his client Greg M. on what to expect during his morning at the Putnam County Youth Bureau . CAREERS’ client Stephen B., (top photo second from left), had a VIP tour of the Putnam Correctional Facility from Captain Frank Christian, (pictured right). 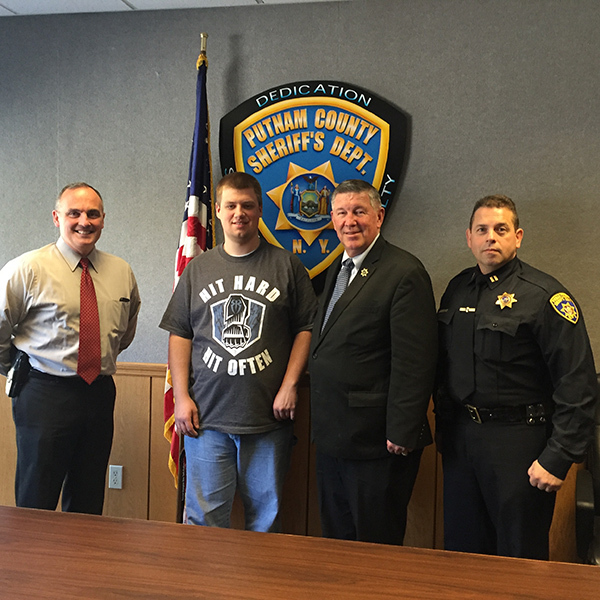 A highlight of the visit was spending time with Captain William McNamara, (left) and Sheriff Don Smith who presented him with a deputy’s pin. 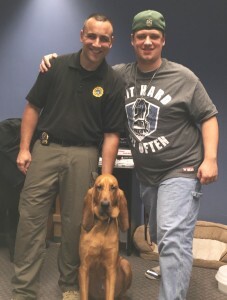 Steven also met Putnam County’s new bloodhound, Chase and his handler Investigator Randall Hill, (pictured below right). Click here to see the News12 video of Steven’s visit. 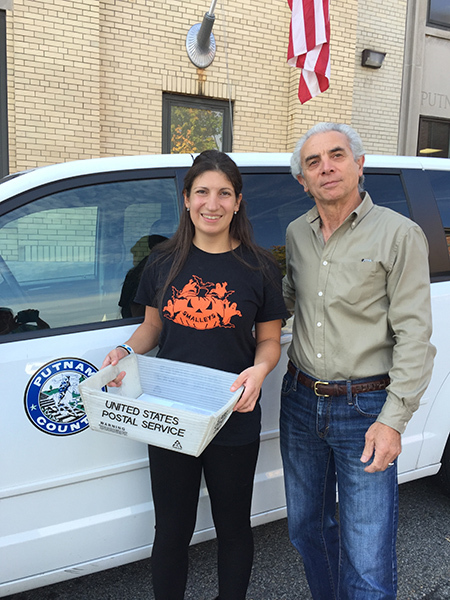 Learning the many aspects of Putnam County’s mailroom and delivery was how CAREERS client Jessica Z. spent her morning, with Dominick Venturella from Putnam County’s Purchasing Department. Participants described their day to County Executive Odell and event participants who gathered at Cornerstone Park in Carmel at 1:00 pm. Comments ranged from “Awesome” and “Amazing” to, “There was not enough time”! For information on participating in Mentoring Day in 2016, please call Tina Cornish-Lauria in lower Westchester at (914) 741-8500 or in upper Westchester and Putnam, (845) 225-8007.